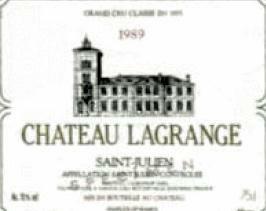 Ch Lagrange St Julien 2005, vintage Bordeaux wine, Totally situated on the Saint-Julien appellation, the vineyard, in one piece, extends over two rugged hills of "Gunzienne" origin oriented North-South. The 2005 Lagrange comes across as somewhat masculine, tannic and austere. The oak is under control, which is always good to see, but the wine lacks charm and sweetness, although there is some nice concentration and body. Give it another 4-5 years and drink it over the next two decades. Ch Lagrange St Julien 2005. Third growth St Julien estate performing to potential. Lagrange vineyard covers 117 hectares in the Saint-Julien appellation. Ranked third in 1855 Grand Cru Medoc, efforts since the 1980s continues today. So meticulous vineyard management and winemaking piecemeal give rise to a powerful and elegant wine, with great aging each year.